You are here: Home / Adam in the Media / Idol Backtrack: Top 3 – Adam Lambert Goes Home, Gets a Streaker and Katy Perry Pulls a Fast One! With regard to the headline, I don’t think any other Idol contestant ever had 2 of these things happen – before or after Season 8! Warning: there is so much to present here and I’m probably going to ramble on and on, so please forgive me. But here we go!! Adam Lambert’s Homecoming was a life changing day for many – myself included. The meeting up of fans, most of whom didn’t know until that day that there was a world filled with others like them, was a day to never forget. 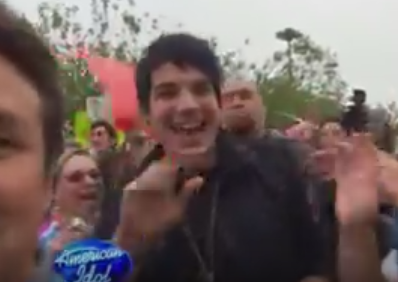 Adam arrived at Fox TV and had his first encounters with his fans. This was an unannounced visit so there weren’t many there. But my soon-to-be girlfriend Glenda was there and even got to ask Adam a question. She’s told me that she had something great prepared but got so nervous all she could say was “what does it feel like to be back in San Diego?” Then he arrived at the radio stations. I couldn’t believe when I watched it on the news that night, that I saw myself in the crowd. Yes, that’s me right next to his right hand! This was shown the night before the Homecoming activities. Just a note, there was no Sea World visit. The fellow guiding Adam in and interviewing him is Tommy Sablan from the Jeff ‘n Jer Morning Show. He’s using his phone and was being broadcast live onto the air. Adam commented that he used to listen to Jeff ‘n Jer when he lived in San Diego! Of course, waiting outside the studio while that interview was happening was both Lila and me, but we didn’t know each other yet. That wouldn’t happen until an hour later when we got into the same car to go to the high school! This station is in the same building as Star 94.1, so he only had to go across the hall! 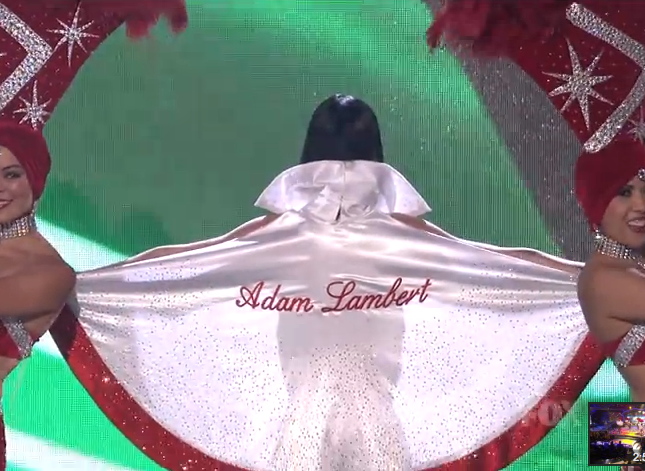 While something was taking extra time backstage (we can only assume it was Katy Perry attaching her Adam Lambert cape! ), Ryan Seacrest adlibbed with Danny Gokey, who commented he just wanted to get on with the announcement of who made the Top 2. Karma?! From the side, you hear Adam squeal, “I wanna see Katy Perry!” to which Kris Allen burst out laughing! Then the reveal – which has to be my most favorite single moment of any Idol episode. This cape event was so memorable and unusual, it is still being written about. In this 2016 Rolling Stone article, American Idol’: 20 Best, Worst and WTF Moments, it scored a BEST! Did you know that Katy Perry turned down $20 Million in 2012 to become an American Idol judge after Steven Tyler and Jennifer Lopez left? Read about it here. Talks about winning… or not! You know what’s coming next week – yes, we get to live through it again!! thanks for this info. I am a huge Adam fan but my reasons for him becoming a judge on AI is separate from my personal feelings. Adam has everything needed to become a judge on AI next year. He has so much singing and performing experience that could benefit any contestant. Also his time as a full time judge on XFAu was amazing as Adam was so appealing not only to audience but TV audience also. He kept the show fun and people loved him. The Top 2 finalists were in his group of 3. One won. Adam offers more than just support to contestants he puts his heart and soul into helping them succeed. This is a rare quality that few realty show judges possess. Wish he could put out a cd of songs he sang on American idol. What a memorable and fateful week!